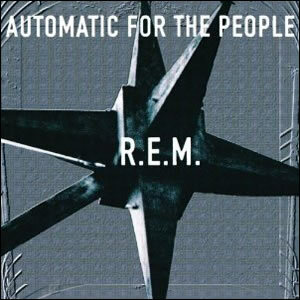 Automatic For the People is the eighth album by R.E.M., released in 1992 following their breakthrough Out of Time. Since the band did not tour to support that album, they were able to start writing and rehearsing for the next album shortly after its release in June 1991. The three musicians -guitarist Peter Buck, bassist Mike Mills, and drummer Bill Berry had informal rehearsals for months, often trading instruments and trying different musical arrangements. Lead vocalist and chief lyricist Michael Stipe was not present for these 1991 sessions and received finished demos at the start of 1992, when he started recording vocals. The album is very much musically subdued and deals with mortality. This was not the original intent, as the band first strove to record a more “upbeat” album, but soon turned further away from the lighter, sweeter pop of previous albums. The finished product was co-produced by Scott Litt at Bearsville Studios in Woodstock, New York. String arrangements by former Led Zeppelin bassist John Paul Jones were recorded in Atlanta. Many critics regard Automatic For the People as the finest R.E.M. album due to its beautiful and moving sounds mixed with melancholy themes of hopelessness and anger. It contains a core set of folk songs with majestic overtones resonating from the exotic instrumentation. This is the group’s coming-of-age album as they pass the “alternative” flame to the slew of new bands which now populated the rock landscape. Produced by: Scott Litt & R.E.M. The pace of the album is immediately set with the opening track “Drive”. This doomy, acoustic-driven tune with heavily reverbed vocals and a touch of accordion has Neil Young quality along with a touch of some of the moodier material by the James Gang. “Try Not to Breathe” follows as another acoustic tune, but much lighter and brighter than opener, although the Stipe’s lyrics are every bit as dark as they narrate the plight of an elderly person who has chosen to end his life. “New Orleans Instrumental No.1” is an entertaining musical break with tremolo electric piano and a sustained-note guitar groove. “Sweetness Follows” contains more ethereal doominess and a comforting melancholy while “Monty Got a Raw Deal” is built like a traditional R.E.M. song with an acoustic folk beginning and the later addition of the accordion and mandolin. “Ignoreland” is the most rock-oriented song on the album, with strong fuzz guitars, distorted vocals by Stipe, and intense drumming by Berry while “Star Me Kitten” is a calm and moody, almost psychedelic tune with ethereal organ and synth effects and a melodic lead guitar. Nearly a decade after his death, many people had all but forgotten about comedian Andy Kaufman before R.E.M. figuratively brought him back to life with “Man On the Moon”, a song which both pays tribute to Kaufman while poking fun at the theorists who thought he staged his own death as an elaborate joke. Musically, the somber calmness seems to fit this theme perfectly and the effective two-part chorus puts the song over the top. The song’s title was later used to name the Hollywood biography of Kaufman, starring Jim Carey. The nostalgic, piano driven “Nightswimming” is an ode to teenage freedom and discovery. The odd musical arrangement and mood makes this a unique and interesting listen. The album concludes with “Find the River” a nice acoustic ballad with piano, fiddle, backing vocals, and an overall good mixture, ending the album with a more traditional song than much of the other material. Automatic For the People was yet another in a string of hit albums for R.E.M., reaching number two on the U.S. album charts and yielding six regular radio tracks. The album would perhaps be the high-water mark for this innovative band who were truly alternative long before alternative was cool.